Local to us is a wonderful facility that rescues and rehabilitates wildlife called the Lindsay Wildlife Museum. A little over a week ago, Hubby and I took the opportunity to visit and had the pleasure of meeting this handsome little guy, a gray fox (Urocyon cinereoargenteus californicus). This handsome fellow was found by humans in their barn when he was a young orphaned kit (or pup) and tried to raise him on their own. But the well-meaning humans found that raising a wild animal is something better left to professionals when the fox got sick after a few months. That's how the fox came to the Lindsay Wildlife Museum where he was rehabilitated. But because he had been orphaned so young he hadn't learned the ability to hunt in the wild from his parents, so he couldn't be released back into the wild. When injury or circumstances preclude the optimal release back into the wild that is the goal of most rehabilitated animals, Lindsay Wildlife Museum makes a permanent residence for the animal in their educational facility where the animal can become an ambassador for teaching people of all ages. 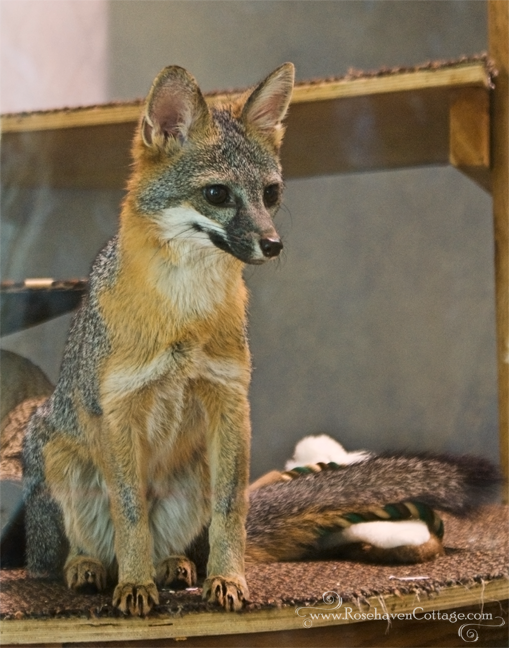 Mr. Gray Fox is one of the museum's most popular ambassador right now. He's only a couple of years old so he has a long career ahead of him (he'll most likely live to be 12-14 years old in captivity). We sat and watched Mr. Gray Fox for about an hour as he excitedly anticipated feeding and "training" time (which we were also able to watch). We were fascinated by his beauty and memorized everything about him. It was the first time we had seen a gray fox, so Mr. Gray Fox was definitely doing his educational ambassador job with us. A week after our educational visit, Hubby and I came home late in the evening from being out. We pulled into our driveway, and Hubby got out of the truck to retrieve our recycling, green waste and garbage cans from the curb. As he did so, he saw an animal that he mistook for a neighborhood cat at first. It crossed from our neighbor's yard across the street less than 10 yards from where Hubby stood. Because of our educational experience with Mr. Gray Fox at the Lindsay Wildlife Museum, Hubby realized that the animal wasn't a cat. It was a gray fox! Hubby slowly walked to where the fox had headed into our next door neighbor's driveway and had disappeared from view behind our jasmine hedge. As Hubby rounded the corner of the hedge, the fox trotted back out toward him across our narrow country-lane-of-a-street, then zig-zagged back across to our side of the street again to our other next door neighbor's yard. All the while Hubby was standing in the middle of the fox's zig-zagging getting a perfect view of this incredible creature that humans rarely see the in wild because of their shy nocturnal habits. When the sighting finally ended with the fox disappearing into the neighbor's yard, Hubby called out to me (I was still up by the house) in a loud whisper, "I just saw a gray fox!" He was so excited. And so was I when he recounted the sighting to me. I wish I hadn't missed it. We are thrilled that after 11 years here at Rosehaven Cottage, we finally witnessed a gray fox living here. We hope it has frequented our own backyard wildlife habitat and not just our neighbors' yards. The gray fox is the only member of the canine family that climbs trees, and we have some of those for it to climb during the night-time hours when it hunts. Hopefully, it hunts in our garden and helps itself to some rodents. Our garden wildlife habitat is small by most standards but the "welcome mat" is always out. In Northern California and other temperate areas of the United States, some birds and mammals begin nesting in January. The nesting season lasts into August. When you prune trees and shrubs during those months, check carefully for nests and be sure any babies are gone before you prune. The safest time to prune is between October and December. He is a beauty! It is always hard to understand that these lovely animals need to be wild...it is their nature.